unambiguous response from the chief executive’s office. former RIM executives and people who dealt with the company. out some of the company’s proprietary technologies. partnership in the future, this person said. within parts of the company. 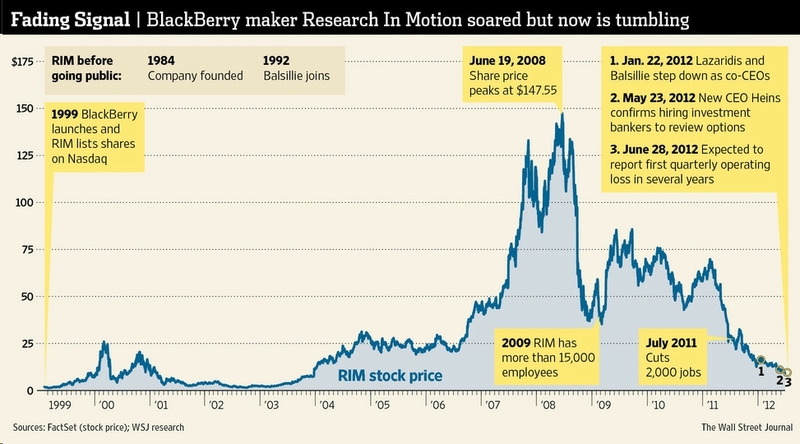 gravitate away from BlackBerrys, RIM moved tentatively. collaborations, however, failed to generate iPhone-like buzz. smartphones from devices to talk and email into pocket-size computers. its share of the global smartphone market erodes. it doesn’t discuss nonpublic internal deliberations. half the U.S. smartphone market. governance and tried unsuccessfully to buy three professional hockey teams. engineering and innovation and Mr. Balsillie’s push for market expansion. network and reputation for security. Brian Blair, then an analyst with Banc of America Securities. displays just a few years later. 2006 and the Curve in 2007—the year the iPhone came out. marquee innovation, a touch screen that physically clicked. said Denny Strigl, at the time president of Verizon. according to a person familiar with it, who said the warning was ignored. As Apple and Android devices ate into BlackBerry’s market share, Mr.
decided that they would use QNX to power the device, called the PlayBook. The QNX leadership team reported directly to Mr. Lazaridis, bypassing Mr.
security network and its popular BBM messaging tool, to outside companies. company more time as it readied its new phone. partners, including carriers, according to people familiar with the effort. use RIM’s network for a fee.